he release of Marvel Studios blockbuster Avengers: Infinity War is getting closer and closer! Captain America has remained under the radar while continuing to do what he believes is right  saving the world one clandestine mission at a time, but with a great cosmic threat approaching, Cap is joining force with Earths mightiest super heroes again to save the world.Today, Hot Toys is very excited to present the latest 1/6th scale collectible figure of Captain America with all new look from Avengers: Infinity War!With stunning craftsmanship, the highly movie accurate 1/6th scale Captain America is finely created based on the appearance of Chris Evans as Captain America/Steve Rogers with striking likeness. 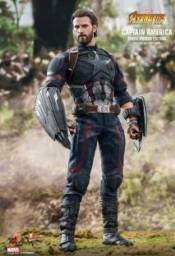 It features a newly developed head sculpt with detailed hair and beard sculpture, a completely newly developed body which portray Captain Americas muscularly-toned body, a striking newly tailored Captain America suit with battle damaged parts on chest revealing the scale patterns underneath, a pair of articulated shield from the technological advanced Wakanda, a specially designed movie-themed figure stand, and a mystery weapon to be revealed after movie release.Marvel fans, expand your Avengers: Infinity War collection with this amazing super-soldier on your display shelf! CAPTAIN AMERICA SEPIA TONE POP! VINYL FIGURE FUTURE FIGHT SHARON ROGERS AS CAPTAIN AMERICA POP!